Observation - Long Hoverfly (m) - Sphaerophoria scripta 1 - UK and Ireland. 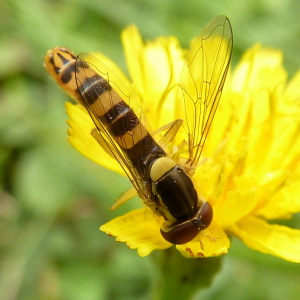 Description: A narrow yellow and black male hoverfly with abdomen much longer than wings. Yellow stripe at side of abdomen. Male, because eyes are touching. A narrow yellow and black male hoverfly with abdomen much longer than wings. Yellow stripe at side of abdomen. Male, because eyes are touching.